Farmers from the Urban Farming Institute of Boston. Photo courtesy of Urban Farming Institute of Boston. For Patricia Spence, executive director of the Urban Farming Institute of Boston (UFI), farming was always a part of family life. Her grandfather, who came from Jamaica, set up his own mini farm right in Boston where he grew everything from grapes to a wide variety of vegetables. Her father then did the same thing in their home. Now as executive director of the Urban Farming Institute, a job that requires plenty of energy and enthusiasm, she is actively pursuing the organization’s all-encompassing mission. She explains that part of the institute’s mission is to engage urban communities in building healthier, more locally-based food systems. The other part is looking at the economic scenario of a neighborhood and trying to create more economic opportunities for residents, which they aim to do by developing urban farming as a commercial sector that in turn creates green collar jobs for locals. Finding land is one of the biggest challenges facing the UFI, which also runs programs that train new urban farmers. Patricia reveals that she’s producing more farmers through their programs than can be accommodated by the available land. She feels the process of acquiring land needs to happen faster. Right now the Urban Farming Institute has been acquiring land from the City of Boston, which has about 800 vacant lots that they have been looking at ways of revitalizing – urban farming is the perfect way to make the fallow land useful again. A turning point came in 2013 with the passing of Article 89 that legitimized commercial urban agriculture in the City of Boston. In 2014 the Urban Farming Institute of Boston, working with their partner, the Trust for Public Land, was able to acquire two properties. The first of these, the Garrison Trotter farm, is approximately twelve thousand square feet in size and according to Patricia, it is pretty much the first official urban farm under Article 89. It’s an ideal partnership, with the Trust for Public Land raising funds that are then used to bring the land up to code – a process that might involve dealing with the soil quality, compost, fencing, signage, and the water and sewer system. Once this is completed, they turn it over to the UFI. From there, as in the case of the Garrison Trotter farm, the land goes into a current land trust. After this the property then goes to Patricia at the UFI, and she leases it out to potential farmers. She’s hoping that more farmers will be able to take advantage of what they’re doing. The UFI has also been working with Historic Boston Inc., an organization that does preservation work throughout the city, on a project that involves a 30,000 square foot property that was a working farm 200 years ago. The City of Boston stepped in and saved it from being razed, and the Fowler Clark Epstein farm will now be considered a historic landmark, as well as serving as the UFI’s new headquarters. The original barn and house will be restored and the plan is to turn it back into a working farm and educational hub. Education and training is another key area of focus for the UFI. They currently run a 28-week course that trains students in all aspects of urban farming. “The first eight weeks is designed to give you a thumbnail sketch of everything you need to know about urban farming,” says Patricia. This includes bringing in visitors to talk about everything from marketing and innovation, to city, state, and federal resources that might be available to urban farmers, as well as how to farm organically and where to get the best soil. After the first eight weeks, the UFI then selects people who are interested in going into the more comprehensive 20 week course. Students receive a small stipend and study from Monday to Friday, with additional field trips where they may visit anything from a hydroponics farm to a bee farm. The UFI also works with students on their crop and business plans. Talking about the effect that an urban farm has on a neighborhood, Patricia becomes even more animated. “It’s just amazing, from the kids to the adults, everybody’s coming by to learn more about farming,” she says. 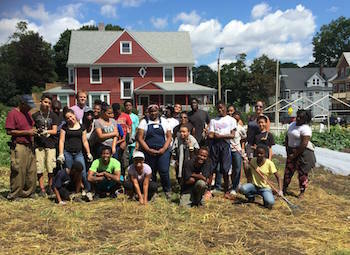 The communities that the Urban Farming Institute works with in the Roxbury, Dorchester, and Mattapan neighborhoods, are comprised largely of African Americans, Latinos, and people from the West Indies, Puerto Rico, and the Dominican Republic. These communities hold some of the highest rates of obesity, cancer, heart problems, asthma, and diabetes. The hope is that through their urban farming initiatives and educational programs the UFI will also have a positive effect on the health of these communities. The organization also participates in two farmers markets and encourages locals to buy fresh produce. In addition, their operational farm supplies about nine restaurants with fresh produce, and the expectation is that the farm operations will fill a segment of the revenue that they need for the year. The vision she has for the future is to further the work they’re already doing – which is extensive – teaching more people how to grow, how to garden, how to save seeds and even how to take edible tours throughout Boston. At their new premises they will have a demonstration kitchen that will allow them to teach even more people. She envisages that once they’re in their new headquarters, when neighbors drop by to find out what they’re doing, they’ll be able to go a step further and invite them to take a course to learn more. Reaching children is also essential and she believes that if you can get children interested in growing vegetables that this exposure can lead to a transformation within the family and eventually result in a change in eating habits that can have an impact on overall health and wellbeing of entire communities.